Cosmo DiNardo’s parents, left and center, walk down the hallway of the Bucks County Justice Center, before their son pleaded guilty Wednesday to killing four young men in Bucks County in July. He will serve four consecutive life sentences in prison. The scene repeats again and again in Aimee King's mind. She sees her son Mark Sturgis in his last moments on an upper Bucks County farm last July. "I hear the bullets. I watch the shock in his face as he falls to his knees in slow motion. I watch his eyes, once sparkling with youthful joy, turn wide-eyed with terror. Sometimes I hear a scream," King said Wednesday in a Doylestown courtroom. King and the parents of three other young men arrived in the morning at the Bucks County Courthouse expecting closure in one of the region's more haunting recent crimes: the gruesome murders and burial of their sons on that remote Solebury Township tract. They didn't get it. Hours after the lead defendant, Cosmo DiNardo, pleaded guilty and was sentenced to four life terms in prison for the killings, his cousin and alleged co-conspirator, Sean Kratz, balked at his own chance for a plea deal. Kratz's last-minute change of heart not only stunned the families, but appeared to shock his attorneys. And it left prosecutors pledging to move ahead with a death-penalty trial at which DiNardo could become a central witness. "We're undaunted as we continue to seek justice," District Attorney Matthew Weintraub said. On three separate trips, he lured the young men to his family's property with a pledge to sell them marijuana, but instead shot them and buried them in makeshift graves. Their disappearances, and the discovery of their bodies after a multi-day search, drew a national spotlight. Dressed in an orange prison jumpsuit, DiNardo showed little emotion in pleading guilty to four counts of first-degree murder, along with charges of robbery, abuse of corpse, possession of an instrument of crime, and possession of a weapon. "I just want the poor families to know that I am so sorry, and that if there was anything I could do to take back what occurred on those days, I would," he said. "I have no doubt in my mind that should the day ever come that you should find yourself released into the community and had an opportunity to kill again, you would do it," the judge said, imposing the consecutive life terms. "To you, human lives are disposable. They have no value." The victims' relatives filled several rows of the courtroom. Some sobbed loudly as a prosecutor read the facts of the case during DiNardo's plea hearing, then stood before the judge to describe their lingering pain and lash out at their sons' killer. "F–ing piece of s–," said Thomas Meo's mother, Melissa Fratanduono-Meo, as she turned and looked DiNardo in the eyes. "It's taking me everything not to f—ing kill you right now." Jimi Patrick's grandmother Sharon Patrick, who said she had raised him because his mother has mental health problems, asked DiNardo to say a prayer every morning in prison. "Please pray for me," she said, "that someday I'll be able to forgive you for what you did to our dear Jimi." Sturgis' mother said the pain was indescribable. "My heartache transcends language itself," King told the judge. "How do I describe emotional pain so strong, so intense, so all-consuming that it manifests as actual physical pain?" Finocchiaro's father, Anthony Finocchiaro, directed his fury at DiNardo: "I pray that Dean's spirit haunts you the rest of your miserable life." After the hearing, DiNardo's lawyers told reporters that they hoped everyone involved could find closure. "What's lost in all this is that he [DiNardo] has family as well," said lawyer Michael Parlow. "Cousins, sisters, brothers, mother and father are here. It's tragic for everyone." But the guilty plea upheld a deal DiNardo made with them last summer, after they found the first three bodies on the Solebury property. In exchange for a promise that they would not seek capital punishment, he confessed to the murders and told investigators where to find Patrick's body. Kratz — who investigators said once described the killings as a "massacre" — had no such deal with prosecutors until recently. Last month, he gave prosecutors video-recorded statements about the case, and the paperwork for his plea had been signed in advance of Wednesday's hearing. The agreement called for him to plead guilty in three of the murders in return for a 59- to 118-year prison sentence. It was not known why Kratz suddenly backed out of the deal. One of his lawyers, Niels Erickson Jr., had predicted earlier this week that Wednesday's hearing would be the "final" proceeding in the case. As the deal appeared to be collapsing, Weintraub said Erickson and co-counsel Craig Penglase gave him permission to speak directly with Kratz in a bid to persuade him to reconsider. "He was resolute," the district attorney said. "I was incredibly disappointed, but that's his right." The defense lawyers weren't available for comment after the hearing. Finley did not set a trial date. But the district attorney said Kratz's statements can become key evidence against him at trial, and DiNardo could end up as a key witness for the prosecution. "We believe [Kratz] made a confession," Weintraub said, "and that confession was made knowingly and willingly." The families of all four victims have filed wrongful-death lawsuits, blaming not only DiNardo and Kratz but also DiNardo's parents, Sandra and Antonio. 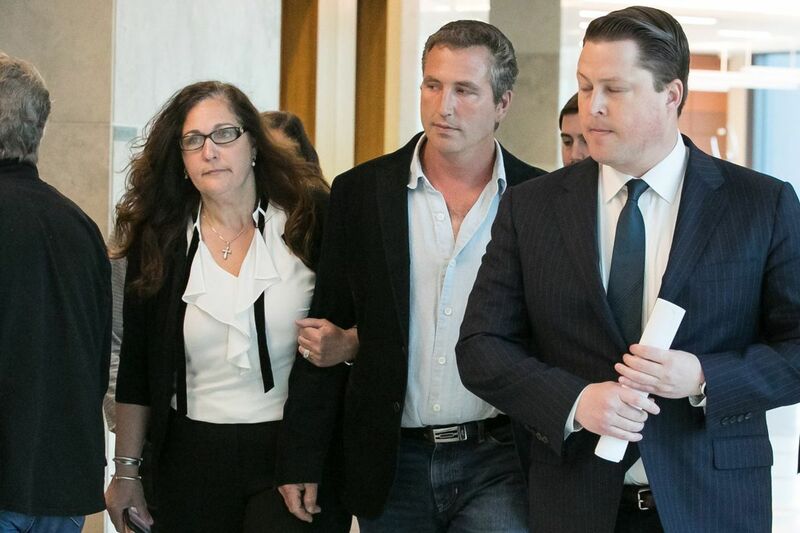 One attorney said the elder DiNardos gave their son a "playland for illegal acts." Bensalem police said officers had encountered DiNardo 40 times, 14 of which were in the year before the killings. Two mental health professionals who examined DiNardo in recent months determined that he would have been unable to use a criminal insanity defense, DiNardo's lawyer Fortunato Perri noted during the hearing. But speaking with reporters after the proceeding, Perri suggested that DiNardo's mental state was a factor. "Mental illness is real, mental illness is sad, and sometimes it can be tragic," he said. "For whatever reason he had, he killed Jimi Patrick, and after that he liked it," Weintraub said. "He became a maneater, so to speak."